A woman who took the photo about an hour before the fire is taking to social media to track them down. 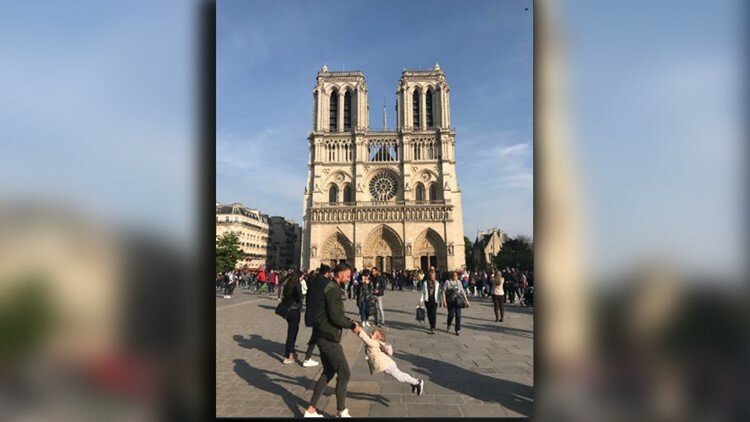 A woman who said she took a photo of a man swinging a little girl in front of the Notre Dame cathedral in Paris an hour before it caught fire is hoping to find the man to share it with him. Brooke Windsor posted the photo to Twitter late Monday night, hours after the fire destroyed most of the historic building. "I took this photo as we were leaving #NotreDame about an hour before it caught on fire. I almost went up to the dad and asked if he wanted it. Now I wish I had. Twitter if you have any magic, help him find this," Windsor wrote. The image shows the man swinging the girl around in front of the two towers of the cathedral. Windsor said it was taken at 5:57 p.m. The fire started 53 minutes later. When asked about the photo, Windsor clarified that she did not know for certain what the relationship was between the man and girl. "I do not know for sure if it was a dad and daughter, it’s simply the dynamic I observed from them while debating on interrupting this moment. It may be an uncle, brother, friend, who knows until we find them," Windsor said. Paris fire commander Jean-Claude Gallet said a major accomplishment of hundreds of firefighters was stopping the flames from spreading to the north tower belfry. Gallet said two-thirds of Notre Dame's roofing "has been ravaged." The fire also brought down the church spire that extended 315-feet high. A photo of a man swinging a girl in front of the Notre Dame cathedral in Paris, April 15, 2019. Brooke Windsor, who took the photo, said this was taken about an hour before the church caught fire.